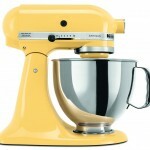 These are my favorite appliances, cookware & bakeware, and kitchen tools (coming soon). If you order through these links I will receive a small commission. Thank you so much for your support! I love my blender SO much. I’ve been using it since 2013, and use it almost every day, often multiple times in a day. 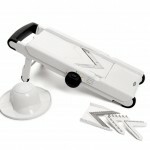 I LOVE that it has a self-cleaning cycle, so it’s never a chore to clean up afterward. I use my food processor all the time for making cauliflower rice, quickly grating a bunch of veggies, chopping up bacon to mix into my hamburgers (yep, I do), and occasionally to make mayonnaise. I don’t think the one I have (since 2007) is made anymore… but that just goes to show the kind of quality Cuisinart is all about. It works just as well as the day I got it. It took me a long time to decide to finally buy one, and I’m so glad I did. Making delicious creamy “real food” ice cream on a whim on a hot day is such a treat! And this machine doesn’t take up too much room in my cabinet or my freezer, which I appreciate. 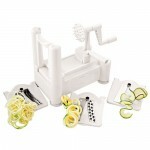 I can’t even tell you how many times I’ve used this to make zoodles / zukeghetti / zucchini noodles. That’s its main purpose in my kitchen! But I’ve also used it for some awesome cucumber noodle” salad, curly sweet potato fries, raw beet strings for salads, and more. I did try a little handheld one that works like a pencil sharpener, hoping to save some cabinet space… it stank. I promptly donated it and kissed my Paderno for being fabulous. Again, the one I actually own isn’t made anymore, and I’ve never had an issue with its performance. I’ve been using it since 2009! It’s great for beating a large number of eggs for quiches or scrambling for a group. It also served as my smoothie-life-saver while traveling (without my Vitamix), can make mayonnaise easily, and is perfect for blending soups right in the pot. 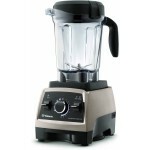 Trust me on this – it’s SO much simpler than transferring to a “real” blender. I use this little tool ALL the time. And the little part with the blade goes right into the dishwasher, thankyouverymuch. I’ve been using this since 2009. I sprung for the big 9-tray and I’m SO glad I did, because when I dehydrate, I tend to fill the entire thing at once. Apple chips, dried banana slices, homemade fruit leather, beef jerky that doesn’t have weird ingredients, drying greens for “green powder” for my smoothies, making the BEST potato chips, drying vegetables for later, and even making raw cookies… I’ve done so much with it over the last several years. Now they have one with a timer, which is useful for time-sensitive recipes, but I usually just run mine all night. 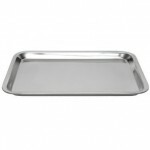 There is also a smaller (and cheaper) 5 tray version. 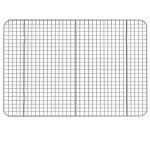 A year after I got the dehydrator, I finally added these nonstick sheets for it. I’ve had the same ones since 2010! 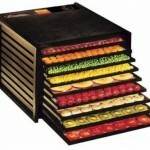 I use them whenever I dry potato chips, fruit leather, my paleo skittles, raw cookies, and some kinds of fruit. I’ve been slicing with this baby since 2010. Homemade french fries, sliced beets, jicama, and so on… I don’t use it as frequently as some other tools, but when I need it, it’s perfect. It doesn’t take up much room in my cabinet, it does what it’s supposed to, and it’s easy to clean. My kinda tool. This baby had been on my wish list for MANY years… we finally saved up and went for it (2015) and it’s incredible. No wondering what has or hasn’t been filtered out of the water at the bottle refill station. No more PLASTIC bottles. No running out, ever. It tastes fantastic, too. I also bought the stand for it, so that it doesn’t have to sit on the edge of my counter for us to be able to fill our glasses and water bottles. I always think people are crazy when they say “since I went grain-free, I don’t have any use for a stand mixer.” I use mine so often! It’s great for mixing spices into ground beef for big batches of meatballs or burgers, for shredding chicken super-quickly, for whipping cream or coconut cream, and of course for all of my paleo baked goods. I phased out nonstick cookware from my kitchen a few years ago, and more recently have also eliminated all aluminum. Now everything is stainless steel, glass, cast iron, and a bit of silicone. I feel great knowing that the healthy food I cook for my family isn’t being contaminated by metals or toxins leeching from our cookware. After years of cooking with a “set” of nonstick cookware, I finally upgraded to stainless steel. And this time, I bought only the pots and pans I knew I would use and need. 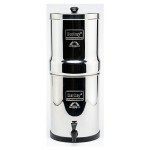 This one is great for smaller amounts of soup, sauces, syrups, and so on. I use this one for large amounts of soup or for making bone broth (stock). It’s also great for steaming larger things (with a steamer basket inside) like artichokes, or for boiling lots of potatoes, poaching chicken, and so on. This size is very versatile and I use it a ton. It’s my go-to for boiling eggs, cooking a normal amount of soup for my family, and most of my general saucepan-y needs. This one sees a lot of action in my kitchen. It’s great for stir-fry, but also a wonderful pot for one-pot meals, since you can move things around to cook other things, then combine everything together… only dirtying one convenient pot. Lots of surface area is a plus. This pan doesn’t see a lot of action in my kitchen, but for special occasions like Thanksgiving, Easter, and Christmas, I’m happy I have it around! It’s also great for toasting large amounts of nuts and seeds for granola (just be sure to stir often). We use this at least once a week (usually more) for pancakes on the griddle side. I’ve also used it for making toast (gluten-free bread or Ezekiel organic sprouted bread), cooking eggs, and making sausage. 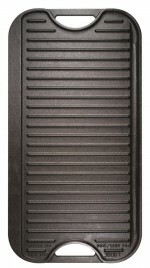 The grill side is great for burgers, steaks, or whatever else you want to grill. I don’t miss my nonstick electric griddle even a little. I can’t find a brand mark anywhere on mine, but this is basically the same thing, and inexpensive. 8 inches is just big enough to cook a couple of eggs for one person. I like it for making small omelets for the kids, too. This is also not the exact one I have, but basically the same, and affordable. 10 inches is great for when I’m making pancakes (but not a huge batch) because I can do 3 at a time. 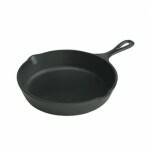 It’s also the right size for about a pound of sausage or making bigger omelets for my husband. 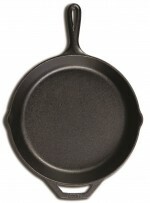 I use this one for sautéing vegetables, making gluten-free cornbread, and making fritatas in the oven, too. I got rid of my crock pot since it had a nonstick coating, and I’m home most of the time I used it anyway. Instead of getting another slow-cooker, I got this to experiment with. Probably our favorite thing I’ve used it for is a one pot whole-chicken, rice, and vegetables meal I start on the stovetop and finish in the oven. I’ve made pot roast in it, cooked soup, and I’m sure other things too… I’m happy with it, and the blue is so cheerful! I’ve had these FOREVER. Which means at least since 2006 but possibly longer. They’ve survived everything. Never cracked, chipped, or failed in any way. I use them often for roasting meat or fish, roasting vegetables, making casseroles or lasagnas, and baking cakes, brownies, and granola bars. They’re not fancy, but sometimes the good stuff just isn’t.